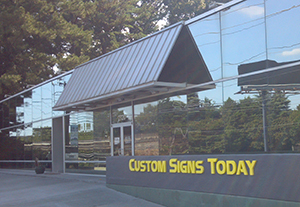 Custom Signs Today in Buckhead has been serving the Atlanta business community since 1988. We are committed to providing the highest quality signs, banners and graphics on your schedule and to your specifications. Whether you need vivid, full color graphics or simple spot color signs we have the equipment to get the job done! Our HP Scitex FB500 and Epson Stylus PRO GS6000 flatbed and wide format printers produce outstanding full color images - including vivid reds, bright oranges and deep rich blacks - for indoor and outdoor use. For decals, simple banners, or basic spot color signs, our Gerber Edge or Graphtec plotters can get the job done with high quality Avery, Oracal, and 3M vinyls. So, if it's banners, trade show displays, vehicle graphics, decals, magnetics, real estate signs, 3D letters, window lettering, full color graphics, or..... a whole lot more, just give us a call! Let us show you what we can do!! "Whether you need a single yard sale sign or 10,000 banners come visit us today and let us fulfill all your signage needs."